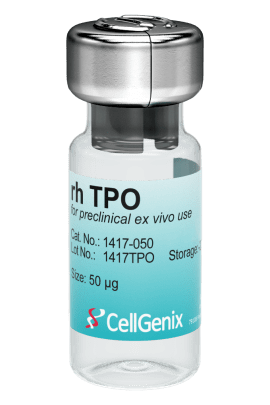 CellGenix Recombinant Human TPO reliably supports the self-renewal and maintenance of hematopoietic stem cells (HSCs) as well as the differentiation of HSCs into natural killer cells (NK cells). It is also used to differentiate embryonic stem cells (ESCs) and induced pluripotent stem cells (iPSCs) into megakaryocytes. CellGenix rh TPO is produced in our dedicated animal-free facility ensuring maximum safety for optimal use in ATMP manufacturing. Thrombopoietin (TPO) is a glycoprotein hormone produced by the liver and kidney. It regulates the production of platelets and stimulates the production and differentiation of megakaryocytes. TPO is used in the cell and gene therapy space for the ex vivo expansion and differentiation of HSCs. CellGenix GMP Recombinant Human TPO is produced following all applicable GMP guidelines and allows for the safe use in accordance with USP Chapter <1043> and Ph. Eur. General Chapter 5.2.12. 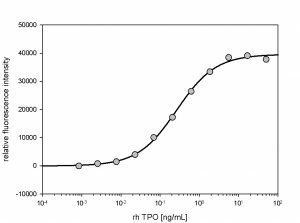 The activity of GMP rh TPO was measured in a cell proliferation assay using the TPO-dependent cell line MO7e. It was calibrated against an in-house reference standard.